Do you care about maximum quality in every detail and make no compromises with your gear? 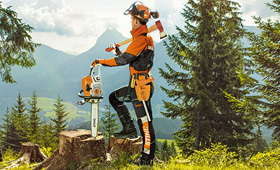 With protective clothing from the ADVANCE series with certified cut protection, you are perfectly equipped for the forest or the treetops. Particularly light, high-tech fibres ensure that the clothing is lightweight, breathable and provides excellent protection from rain and cold. Elastic inserts, practical ventilation openings and well-thought-out pocket solutions are a given. All trousers and jackets in this series can be perfectly combined with each other. This allows you to assemble your gear to meet your specific requirements.